I discovered a few days ago that I would be one measly $3.50 length of lead short of what is necessary to finish the last transom. Today, in order to procure the measly length, I undertook the half-hour-or-so drive to Kensington. While waiting patiently at Weisser for my lead to be pulled, I noticed they had all these foot-square pieces of a swirly iridescent blue lying in stacks on the worktables, and great sheets of the stuff leaning against the vertical glass bins lining the walls. I paced around and eyed the glass, pretending not to. It became inevitable that I would take some home at the point I decided to go ahead and ask what the glass was. They said it was a Spectrum glass. I/339-6S, to be exact, which is their Dark Blue/White, Wispy... except iridized. Spectrum's website doesn't give color chips for the iridescent variations, going on about how tough it is to photograph it properly. This is how the glass looks in reflected light. 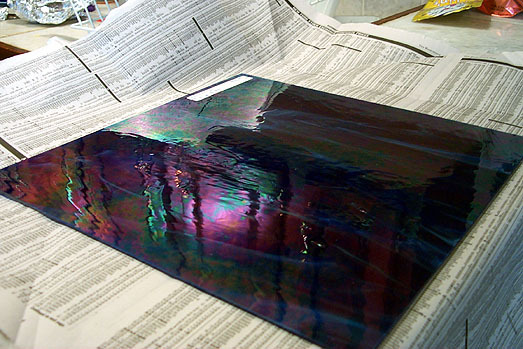 Here you can see the shiny iridescence that coats the glass's surface. 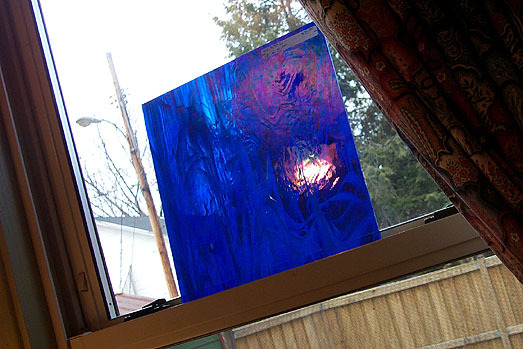 Putting the glass against a window in order to view the light it transmits, you can see that the base color of this glass is a transparent cobalt blue, which is finely swirled with opaque white. Super, super cool. The person behind the counter at Weisser said they were just getting it in, and if I'd come in half an hour earlier, I would have missed it. Even though I have no idea what I'm going to do with this pretty blue glass, I'm glad I happened in when I did. That is some supercool stuff. I'm pretty excited to see what you make with it. Wow! That's amazing! Any ideas for a pattern yet? It seems that Don isn't as taken with the iridescence as I am. Rats... this means I'll have to make something that can be hidden in a corner where it will not make the man of the house wince. No clue, Sarah. The only other project idea I have in mind for after I finish the transoms is to redo these two wall sconces in our bedroom, and if Don hates the iridescent glass, it won't get used there. I'm not sure it'd work there anyway, for lamps and stuff you really want a more opaque glass to diffuse the light, I think. I'm with Kim and Sarah - those colors are really lovely. I like the blue. I think it'd be cool for sconses, it could be a bit dark though. Heh. So basically the consensus here is: What do *icky boys* know? I've got totally rocking girl power happening on my comments board. You can add MommaB to your list of blue glass lovers. It is gorgeous!! I like the blue glass too! Apparently, Josh, also, has rockin' girl power. You're totally going to regret having said that. Have mercy on Blossom/Josh. He just had his wisdom teeth yanked. It's prolly the Percoset talking. Anyway, I never said I hated the iridescent blue/pink/yellow/purple/teal oil-slick looking glass. It's just not something I would've picked. I'm sure my brilliant, sweet girl will make wonderful use of it. Seriously, even to my untrained eye, your work looks great, and increasingly more flawless. And thank you for the compliment---"flawless" is pushing it but I try to get closer to that state all the time.